History doesn’t repeat but it rhymes, or so the saying goes. In retrospect, we see many similarities between 2018 and 1994. Fed Chair, Janet Yellen said yesterday that economists were not good at stock valuation, but that she saw no red or even orange signals. Here’s one … The S&P 500 Relative Strength Index, a measure of “overboughtedness” is the highest it’s been in 20 some years – by a lot. St Louis Fed President James Bullard has released a paper detailing a revised approach to economic forecasting. It’s a very smart way of looking at the world – read it here. Briefly, he is saying that the current way of viewing the world as converging to a single state is no longer useful and instead should be thought of as a set of possible regimes the economy could visit, with the regimes being generally persistent, requiring different monetary policy responses, and switches between regimes as not being forecastable. In his submission to the FOMCs quarterly economic projections, he declines to provide a forecast for the ‘Long Run’, as it is outside his model projection range. His low projection of the Fed Funds rate over the coming years reflects his view that the present regime has a low neutral real interest rate, a switch to a higher regime is unforecastable. If it were to happen, it would cause a change to many variables – policy would not reflect a gradual shift to a single state, but would have switched regimes. This approach to forecasting was pioneered by James Hamilton. The math is pretty complex (lots of markov processes, etc. ), but here is a simple way to look at it. Suppose we have two possible states in the world, the bull state and the bear state. The variable that determines the state is unobservable, and since you can’t see it, you can’t forecast it. Suppose in the bear state that the daily returns to an asset, like the stock market, are selected from a normal return distribution with a negative mean. Conversely, in the bull state, the mean is positive. If the state variable is pointing at bear, the trend will be down, if bull, the trend will be up. The trendiness of a market is determined by how likely we are to remain in the current state. For example, if the probability of jumping from one state to another is 5%, trends are more likely to persist than if the probability were 20%. What causes the state variable to jump is unknown, as Bullard describes. The Fed: Think Local Act Global? Is the Fed the world’s central bank or a domestic institution? 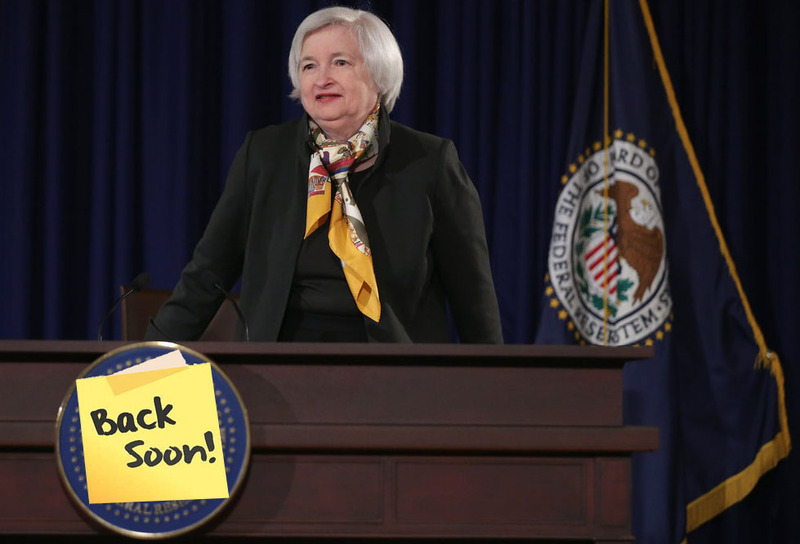 As we see it, this is the key question for the Fed at its next meeting. The economic data since the last meeting, looked at in isolation, should lead them to continue hiking the Fed Funds rate – simply put, the unemployment rate now stands at 4.9%, and inflation has made further progress back to the target with core CPI at 2.2%. The charts below show the progress toward the dual mandate. On the employment side we look at the unemployment rate against the NAIRU measure. On the inflation side we use the sticky and flexible price series. Generally we aren’t ones to criticize the Fed – post crisis they have done an excellent job supporting a recovery through zero rates and unconventional measures, and have begun to step back without causing the panic and damage that was predicted. It’s an incredibly difficult job, with huge importance. That said, our view is that the Fed has pretty much hit the mandate, the data supports that, and an end to zero rates is warranted soon. The drop in Q1 GDP looks increasingly like a quirk. In reading the dueling Fed blogs as to the cause of this drop (New York FED says winter and San Francisco FED says residual seasonality), we can’t help but think that either way, Q1 is not a true reflection of the economy now or going forward. Do you think productivity fell 3% in the first quarter? Although the Fed has consistently been too optimistic with GDP projections, it has also been too pessimistic on jobs. Only one of these is in their mandate. Put simply, the economy doesn’t feel like it needs the same rates as the depths of the crisis, particularly at a time when expansionary policies are starting to take hold elsewhere.